A geyser erupts in the sleepy Bay of Plenty village of Kotuku. It is good and bad news for locals last seen coping with a gold strike a generation ago. Retired postmaster Jack Cavanagh was enjoying the quiet life, but his good friend retired stationmaster Rangi Rangihau has disappeared after predicting a geothermal event. Former storekeeper Ron Atkinson is run off his feet selling his wife’s pies to the influx of tourists whom local iwi and a government department are vying for custom of, along with discreet brothel keeper Ruby Brough and local drug tsar Bob Rogers. Electronic media and social outlets go viral and set the government’s spin doctors into a tailspin with the recently merged Department of Conservation, Tourism and Environment getting its teats in a terrible tangle over lagoon preservation and geyser exploitation. When Jack’s grandson Jason also goes missing, the national Search and Rescue spotlight is on Kotuku, driving into hiding the one chance for the missing couple, a mistreated, pie-pilfering Great Dane. 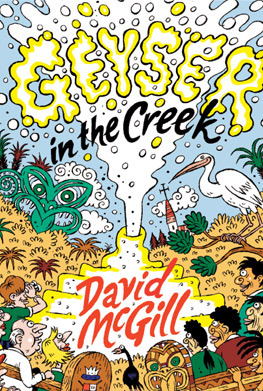 The NZ Listener identified ‘a veritable Milkwood of characters’ in Gold in the Creek, ‘a shaggy sheep tale that is a bit of a dag’. The characters are back and added to in a digitally enhanced satire on media and government attempts to tweet the tourist face of a quiet village. 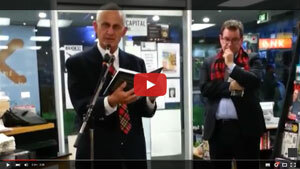 The whimsy of Whisky Galore, the furious farce of Blott on the Landscape and the dinkum Kiwi way with words.